Out of all the so-called British dance-punk bands to pop up over the past couple of years, I always thought The Rakes were the most guilty of emulating the Gang of Four sound. Not that I held it against them; their debut album Capture/Release was an enjoyable blast of raw post-punk angst, but maybe just a little too raw at times for my taste. Still, I was curious to see if they would progress on their sophomore record Ten New Messages. It is definitely more subdued, but no less urgent in terms of the rhythm section. This time they've also given themselves room to work in some deft and fragile melodies between the furious guitars, and it's quite an accomplishment. For a taste of what I'm talking about, check out this b-side "Cold", and one of my favourite tracks from the album "Little Superstitions". They both just might be more intoxicating than anything I've previously heard from these fine blokes. Look for Ten New Messages in stores now. With the release of the new TMNT movie in theatres this weekend, it's conjured up some fond memories from my childhood... and a few not-so-fond memories too. I thought I had completely purged the god awful Teenage Mutant Ninja Turtles "Coming Out Of Their Shells" tour from my mind, but this week I stumbled across the entire album (yes they recorded an album) on the internet. If you're not familiar with it, basically after the third feature film the marketing machine went into overdrive, and they put musical instruments in the hands of 4 guys wearing the Turtles costumes and turned the whole thing into a radical rock show extravaganza. I had seen clips of the live show but never heard the studio recordings of the songs... let me just tell you it's every bit as ridiculous as you would expect. Definitely a dubious moment in TMNT history, but still pretty damn hilarious. Hopefully the new CG turtles will do a similar tour in a few years... maybe they can open for Billy Talent or A New Found Glory. 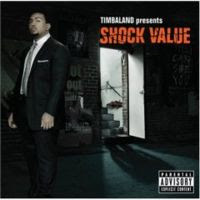 For someone with as much hype as Timbaland, it sure has taken a long time for his newest album Shock Value to leak. And for someone with so much hype, Timbaland sure does take a lot of chances. His newest album has an amazing array of guests artists; from JT to Elton John, from Dr. Dre to Fallout Boy. It doesn't always work, and doesn't make for a completely cohesive album, but at least it's always interesting. Most disappointingly though, the track featuring MIA is available only on the UK release of the album. "Oh Timbaland" is a great lead off track and perhaps my favourite from the album, using an amazing Nina Simone sample for the chorus. He was somehow able to remix her chorus to "Sinnerman" ("Oh Sinnerman, Where you gonna run to?") to "Oh Timbaland, Where you gonna run to?" Ha! Simply brilliant. Not only is he able to use someone like Simone, he is able to quickly transition to pop artists like JT. For this he deserves our respect. Hey look... it's another Muzak For Cybernetics Mixtape! This time around Zak is back and we dig into the shadowy recesses of his iPod in search of The Next Big Thing™. The show runs 90 minutes as opposed to the usual hour, so hopefully it will provide enough listening to get you through another month. Download the MP3 above, or subscribe to one of the podcast feeds below. By now we all know that Hot Chip is not only a great band, but also a great remixer. Combined with the Junior Boys, Hot Chip makes beautiful babies. If you liked the amazing, original version of this song, you'll love the remix. This appears on the Junior Boys' remix album Dead Horse EP. If I could give a reason for my recent absence from this blog, one might be a lack of interest in most of the music I've been hearing recently. Even though I've been bombarded by music lately, I've found myself hearing very little to be excited about. 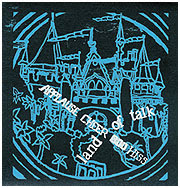 But something about Land of Talk's new EP Applause Cheer Boo Hiss really excites me. While I acknowledge that the band is not terribly original, and its easy to make comparisons to other current bands like Yeah Yeah Yeahs or Blonde Redhead, Land of Talk combines all these influences in remarkably original ways, including singer Elizabeth Powell's amazingly complementary vocals. There isn't much I can do to explain them, but I think their music more than speaks for itself. I can't wait to hear more from these guys. While I fully admit to being in love with Leslie Feist, I also have to admit that I didn't exactly love her last album Let it Die. I think the album had some great songs, but I didn't enjoy the album as a whole, not to mention the album was a little too French-sounding for my tastes. Almost as if she could read my mind (as lovers often do) Feist's new album largely downplays her French influences and is an incredibly better album. 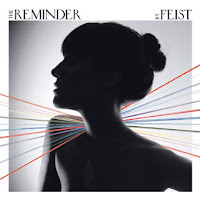 If her first album highlighted Feist's amazing vocals, her new album The Reminder highlights her often unacknowledged songwriting skills. I think "I Feel it All" completely captures her amazing writing skills, creating one of her poppiest, funnest songs ever. And if you're desperate to just hear her voice, "The Park" is probably one of the most hauntingly beautiful vocal performances I've ever heard. We will all be patiently awaiting The Reminder when it is released on May 31st. Xiu Xiu are known for (among other things) taking well known songs, completely obliterating them and then rebuilding them from the ground up. So what happens when a handful of bands get the chance to do the same to their songs? Find out on April 10th when 5RC releases Xiu Xiu Remixed & Covered, a double album that features one disc of covers and one disc of remixes. Among the artists involved are Kid 606, Devendra Banhart, and Why?, but I think Sunset Rubdown's version of "Apistat Commander" (from Xiu Xiu's second album A Promise) is the definite standout. I also enjoyed Her Space Holiday's take on "I Luv The Valley OH! ", and Xiu Xiu's own demented cover of New Order is included for the sake of posterity. » Bonus Track: Her Space Holiday - I Luv the Valley OH! Ace Fu Records have been establishing themselves as an indie label to watch as of late, with a growing roster of great up and coming bands. Heck, Annuals' Be He Me was one of my favourite albums from last year, so when a new EP from a band called Illinois arrived in my mailbox, I had to at least give them a chance. Now I know a lot of people criticized Annuals for being a pastiche of popular indie rock sounds from the past couple of years, and Illinois probably fall into that category too (the fact that their band name is also the name of Sufjan Stevens' most successful album to date has to be a coincidence, right? ), but they won me over somewhere in the span of these 7 songs. I think they remind me of Stars, Modest Mouse and Mates of State all thrown into a blender, but there are probably plenty of other familiar sounds in there. Either way, they're a band to watch, and this EP is definitely worth a listen. What The Hell Do I Know? is available in stores now. Although most people knew The Postal Service initially as the electronic side project from Death Cab For Cutie's Ben Gibbard, I think the second half of the duo, Jimmy Tamborello, is slowly starting to make a name for himself as well. And, I might add, deservedly so; as time goes on it's becoming more obvious that Tamborello is the true genius behind that band. I wasn't completely taken with his last James Figurine solo album, but this new Dntel album is suprisingly solid. This is the first time he's recorded under the Dntel name in 6 years, and the first one released on Sub Pop. Almost every song features a guest vocalist, including such indie faves as Jenny Lewis (Rilo Kelly), Edward Droste (Grizzly Bear) and Conor Oberst (Bright Eyes). It may not be as poppy or upbeat as The Postal Service, but it has a real ethereal, Air kind of vibe which works just as well (if not better) in my opinion. Dumb Luck hits stores on April 24th. I've been looking forward to hearing a full-length album from Battles ever since they handed my posterior to me with their first batch of EPs, released on 3 different labels in 2004. 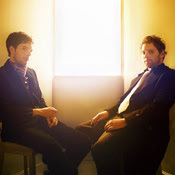 They have since signed to Warp Records, who now have the responsibility of unleashing Mirrored on the world in May. The musical talent contained within this band is immense, and although the music is pretty wild and experimental at times, I like to think that just about anyone can appreciate their precision. Drummer John Stanier (formerly of Helmet, also of Tomahawk) is one of the most talented guys I've ever heard behind a kit; most of the songs are built around his air tight percussion, while guitarists Ian Williams (formerly of Don Caballero) and Dave Konopka along with keyboardist Tyondai Braxton add layers of texture and sound all around it. The album's first single "Atlas" is undeniably strange, mixing bizarre cartoony vocals with a pulsating beat (check out the video on YouTube). The rest of the album will proceed to blow your mind. Fans of Don Cab, Trans Am and Hella just might have an inkling of what's in store here. The single for Atlas will be released on April 2nd; Mirrored hits stores on May 15th. When I heard that the husband/wife team of Avey Tare (Animal Collective) and Kria Brekken (Múm) were going to be teaming up for an official collaborative release, it sounded like a pretty crazy idea. Given the loose and experimental nature of both bands, the audio possibilities seemed virtually endless. Would it be instrumental? Would it be electronic? Would it even be listenable? Now that the album, Pullhair Rubeye, has found its way onto the net, the first two questions can be answered: the songs were recorded entirely with guitar and piano, some instrumental and some with vocals. The third question is little harder to answer. When the record first leaked online, fans noticed that long segments of the songs actually sounded like they were being played backwards and at different speeds. In an attempt to be helpful and restore the music to its proper form, people began the process of reversing the songs and correcting the pitch. Little did they know that these adjustments were undoing how the album was intended to be heard in the first place. Avey Tare recently responded to the situation on the Animal Collective message board (Gorilla vs Bear has the entire post if you want to read it). It's kind of a fascinating situation, as fans can now choose how they prefer to listen to the album. Personally I like it just fine with all the backwards stuff in it; some of the songs seem less compelling than others, but mostly it reminds me of Múm meets Sigur Ros or something along those lines. I'm sure it will sound boring and aimless to many, but I think it was worthy of being released. Pullhair Rubeye will be available through Paw Tracks on April 24th. When it comes to the music of Yoko Ono, I'm afraid I must plead ignorance. Like most people, I know her mainly for her marriage to John Lennon and that nasty reputation of having broken up The Beatles. It's easy to see how her own artistic endeavours would have been unfairly written off though, and as a result I've always been curious to hear some of her work, especially knowing the influence she had on Lennon's own creative output. This new remix album Yes, I'm A Witch seems like as decent an attempt as any to bring Ono's songwriting to a new generation, although I must admit I was mainly drawn in by the impressive line-up of artists that she handpicked for involvement (including Spiritualized, The Apples in Stereo, Cat Power and The Polyphonic Spree). I don't think I came away particularly educated in her discography, but there's still some intriguing stuff here, whether it be the complete reconstruction of the 26-minute avante-jazz piece "Cambridge 1969" by The Flaming Lips, or the sharp retro beats of "Sisters O Sisters" that make Le Tigre and Yoko seem like ideal cross-generational collaborators.